Chief’s Magic is an online video slot machine game released in November 1999 and it is offered exclusively at online casinos powered by Microgaming. This online video slot game has 3 reels and 1 pay line. The theme of Chief’s Magic is about the Native Americans (or American Indians), the indigenous people living in North America. The American Indians were actually the first people who lived in the place now known as the United States, long before it was conquered and dominated by Europeans. They formed tribes, hunted, lived and prospered well on their land. What makes them a very unique people is they have a rich heritage as well as a strong respect and appreciation for nature. They have rituals, beliefs, customs and ceremonies intended for many purposes – religious guidance, health and healing, celebratory dances, etc. You will surely feel that you are “one with nature” when you give the Chief’s Magic online slot game a spin! Microgaming online slot games are available to players in 2 formats – download and no-download. Whether you like to download their software first or you prefer to play instantly without the need to download, then Microgaming surely has online slot machine games to accommodate your every slot gaming preference. Good thing that Chief’s Magic is available for instant play, so you do not have to download anything to find out if this game interests you in a way that you would like to spend some real money on it. Chief’s Magic is created for players who like to play simple one-arm bandit slots presented in a cool Native American theme. The Chief’s Magic online video slot game features a fairly simple old-school 3-reel slots game with a maximum coin jackpot of 1,800 and a maximum cash jackpot of $9,000! The quality of the graphics and sound that Microgaming provides is absolutely fantastic and top notch. They have an impeccable reputation of making the most stunning graphics and true-to-life sound effects that will truly transport you to “that specific theme” they used in any of their slot games. Most people love to play games incorporated with Microgaming software because they have smooth animation and engaging yet non-interfering sounds. 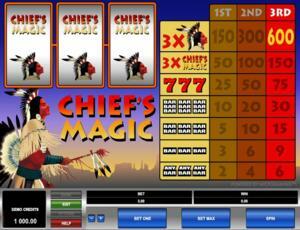 Since it is essentially a no-frills type of slot game, Chief’s Magic has been designed to have a simple classic slot game with matching sound effects. The casing of the reels includes the reels, buttons and the paytable. The overall graphic design of Chief’s Magic displays the great outdoors of North America, where Native American Indian tribes normally reside. A wide array of colors is used in this game including blue, red, orange, brown, black and white. There are no card deck symbols available in the Chief’s Magic online video slot game. The regular symbols that you will find in Chief’s Magic are the 3-Bar, 2-Bar, 1-Bar, Red Seven, Chief’s Magic Logo, and the Chief himself. There is no Bonus Feature in this game. Chief’s Magic has 3 reels where you may bet on 1 pay line only. The minimum bet amount is 0.25 and the maximum bet amount is 5.00. You can wager from 1 up to 3 coins per pay line. Thus, the minimum amount you can bet is 0.25 and the maximum amount you can bet is 15.00 per spin. The maximum payout in the regular Chief’s Magic online slot game is 600 coins. There is no Autoplay function in the Chief’s Magic online video slot game.